Long time no blog, so don't really know how to begin! Basically just had a pretty busy Christmas hols and wasn't feeling particularly inspired to post; but now I'm back at uni, exams are done, and I got cool fences in Bristol to stand next to again so hopefully I'll post a bit more from now on wards. And I got my gal Izzy back behind the lens where she belongs. These cobalt trainers are my new faves - I got them over Christmas and thought they'd be quite hard to style but I actually just wear them with everything now regardless of whether I should. They're just so comfy and fab. Loving Adidas trainers at the moment - seriously tempted to get these Stan Smith's even though I already have the green ones, but you can never have enough pairs of trainers and that's a fact. Love this outfit, everything is perfect. I loved the jacket and the bag. I completely agree with you on Adidas trainers, I am so tempted to buy some Stan Smith's too! Perfect casual outfit! Love this look. 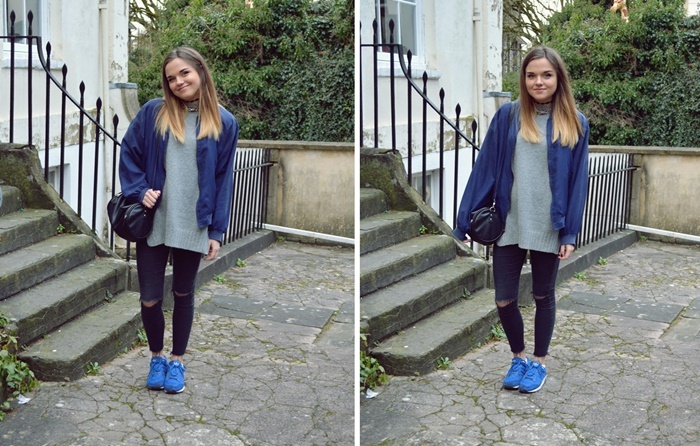 gorgeous outfit, those trainers are beaut! Love those trainers and that jumper is so perf! They look great, keep on bloggin! All the best from The Model Factory!